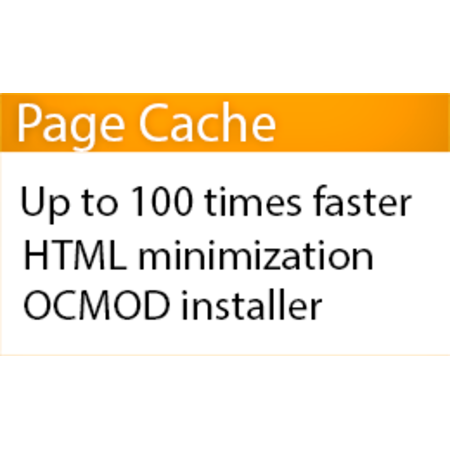 HTML Cache to speed up OpenCart. Dramatically increases OpenCart site speed and reduces server load. Up to 100 times faster than realtime opencart page load. Supports multistore, multilanguage, multicurrency, https protocol. When logged in to admin panel you will see a bar in the bottom of your frontend with speed comparison and a button to clear cache. By default, pages are cached for 3 hours, this parameter can be changed from admin panel. Also this module compresses HTML output to make a code smaller. Easy installation via native ocmod. Cache is not always needed, there are lots of situations when you need realtime information. So this module returns uncached contents for admin panel, for logged in customers and customers that have products in their cart. This can be configured in module settings from admin panel. Also we plan to add automatic cache clear on product/category/etc. update in admin panel. !! !PLEASE DON'T FORGET TO RATE A MODULE IF YOU LIKE IT!!! 1. Open your shop backend.